You understand that service is about making a connection. A smile, an extra hand, even an empathetic nod can make all the difference in someones day. Its genuine, and its at your core. Youre a people person through and through. Making someones day better, makes your day better. You have the opportunity to shine. To bring a bit of unexpected joy to someones day by being welcoming and friendly, while ensuring an exceptional guest experience. To showcase your passion for people by anticipating guests needs, and providing a bit of surprise and delight by taking proactive approach to caring for them. To inspire your team to deliver a guest experience that blurs the line between restaurants and quick service restaurants. You make guests feel important, and confidently answer their questions about our food and our brand. To lead by example, as well as support your team and guide them when orders need additional assistance. To connect, in the most meaningful way with guests during their visit at all touch points. To be a model of calm and fairness with guest experiences, and handling various situations with composure and positivity. 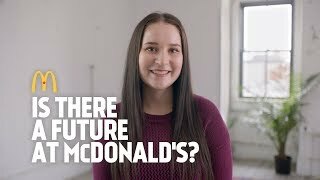 To make McDonalds about more than just our awesome, crave-worthy food. To make it an experience that delights and builds a strong relationship with our guests.